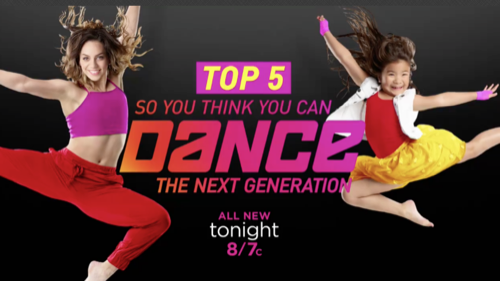 Tonight on FOX, So You Think You Can Dance continues with an all new Monday, August 29 season 13 episode 11 called “The Next Generation: Top 5 Perform + Elimination,” and we’ve got your So You Think You Can Dance recap down below. On tonight’s episode, the Top 5 dancers perform, and one of them is eliminated. On the last episode, only the best of the best remained as the competition heated up. Ruby Castro ended up being eliminated from the competition. Did you watch the last episode? If you missed it, we have a full and detailed So You Think You Can Dance recap right here for you. Tonight’s special 250th episode of “So You Think You Can Dance: The Next Generation” is a showdown between the top five performers who are competing for the number one spot. At the end of the episode, one contestant will be eliminated. The first contestant to compete is Tate McRae who, along with All-Star Kathryn, will be performing a contemporary piece choreographed by Stacey Tookey. During the dance, the two represented themselves and the special relationship they share. Paula felt their execution was beautiful, Maddie loved the connection between the two which made for an amazing performance, Jason appreciated the performance and Nigel said that Tate was extremely gifted. Kida Burns and All-Star Fik-Shun are up next. The two perform a piece without a theme; instead, the dance is all about energy. The high-energy performance, co-choreographed by Pharside and Phoenix, received mostly a positive reaction from the judges: Maddie thought it was amazing, Jason felt that their moves were crazy and Paula said Kida was a force with which to be reckoned. Nigel, however, said that Kida’s style during the performance left him a little cold. Emma Hellenkamp is the next contestant to perform. Along with All-Star Gabby, the two performed a routine choreographed by tap legend Savion Glover that focused on the music of tap itself. Jason said that Emma gave a nice performance, Nigel said he adored the routine, Paula called Emma’s dancing incredible and Maddie was thrilled that she was able to exhibit her ability to slow down her taps with crisp movements. Next, J.T. Church and All-Star Robert perform a father-son piece choreographed by Stacey Tookey. Nigel thought the routine was beautiful, Paula said the piece was moving and compelling, Maddie felt that the story was inspiring and Jason opined that J.T. has the perfect mix between maturity and innocence when he performs. Tahani Anderson and All-Star Komfort are next to take the stage. The two perform a tribal dance choreographed by Dave Scott. Paula was in awe of the complicated fast-paced routine, Maddie loved the tribal style of the routine, Jason felt the two nailed the challenging dance and Nigel thought it was fantastic.For the second half of the special 250th episode show, the kids take over and choreograph their own dances. For the second half of the special 250th episode show, the kids take over and choreograph their own dances. Tate McRae and All-Star Kathryn are first to perform. Tate chose a masked theme to represent the masks that everyone wears. Maddie was blown away by Tate’s choreography, Jason felt the dance was beyond Tate’s years, and both Nigel and Paula felt that Tate was a wonderful choreographer in the making. Tate McRae and All-Star Kathryn are first to perform. Tate chose a masked theme to represent the masks that everyone wears. Maddie was blown away by Tate’s choreography, Jason felt the dance was beyond Tate’s years, and both Nigel and Paula felt that Tate was a wonderful choreographer in the making.Kida Burns developed a robot-themed dance entitled “Manipulator” for himself and All-Star Fik-Shun. Jason said the dance was bound to go viral, Nigel thought Kida’s choreography was impressive, Paula gave Kida a standing ovation, and Maddie said the dance was insane and one of her favorites of the season. Kida Burns developed a robot-themed dance entitled “Manipulator” for himself and All-Star Fik-Shun. Jason said the dance was bound to go viral, Nigel thought Kida’s choreography was impressive, Paula gave Kida a standing ovation, and Maddie said the dance was insane and one of her favorites of the season.The All-Stars performed a Grecian-styled dance next. The All-Stars performed a Grecian-styled dance next.J.T. Church choreographed a routine called “The Friendship Dance” for himself and All-Star Robert. Nigel loved the routine but did not like the outfits, Paula thought the dance was magical, Maddie liked the performance and Jason was blown away by the choreography. J.T. Church choreographed a routine called “The Friendship Dance” for himself and All-Star Robert. Nigel loved the routine but did not like the outfits, Paula thought the dance was magical, Maddie liked the performance and Jason was blown away by the choreography. The All-Stars performed a “Breakfast at Tiffany’s” inspired routine next. Tahani Anderson and All-Star Komfort performed a dance called “No Flex Zone” inspired by the movie “Grease.” Paula thought Tahani rose to the challenge with her choreography, Maddie loved the choreography, Jason felt the dance was a lot of fun and Nigel said he couldn’t take his eyes off Tahani. Emma Hellenkamp choreographed a dance called “Here With You” that was inspired by her relationship with All-Star Gabby. Maddie was impressed with Emma’s tap choreography, Jason thought the performance was classic Emma, Nigel liked the dance and Paula said the routine was well done. Maddie then gave a special performance with Travis Wall to celebrate the 250th episode. At the end of the performances, Tahani Anderson was eliminated from the competition. Emma Hellenkamp, J.T. Church, Tate McRae and Kida Burns will continue on for a chance to compete in the finals.